I am very excited at the moment. I have a new cook book and I have been inspired to BAKE! 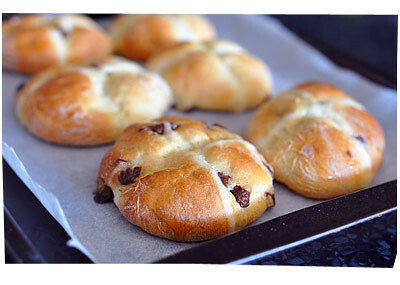 With Easter coming up, the bakery sells hot cross buns for $6.50 for a bag of 6. 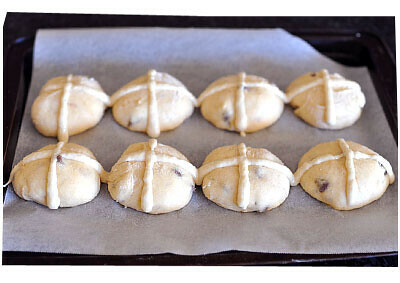 Now I LOOOOOVE hot cross buns. I can eat about 3 in one sitting. And my kids could probably eat 2, maybe 3 each. Which means I would have to buy 2 bags for $13, which ain’t happening. So I was inspired to try and make some myself. The recipe looked super easy, and it was. I tried out the recipe 3 times (in one week!). In the end I halved the original portion, to make 16 small buns, because the original amount of yeast made the dough grow so large that I didn’t have a bowl big enough to fit all the dough! It was spilling out over the sides! Anyway, I thought I’d share a slightly modified Chocolate Chip version on my blog (if you want the original version with sultanas and currants, I guess you’ll have to buy the book!). These are so fricking amazing. The smell, the texture, the light sweetness, the glaze, the bits of chocolate… they are absolutely delicious. 1. Stir yeast and water in a large bowl. Let it sit for a few minutes while you get the rest of your ingredients together. 2. Add flour, sugar, cinnamon, egg and butter (make sure it’s soft!). 3. Mix very well for 3 minutes with a spoon. Add chocolate chips and then give it another good stir for 2 minutes. 5. Preheat the oven to 170C. 6. The dough should have doubled in size. Knock back the dough with the spoon, and transfer onto a well floured surface. The dough is pretty sticky and soft, not like pizza or bread dough! I rolled them about and cut them up with a spatula and a spoon, I didn’t actually touch the dough with my fingers. 7. Divide the dough into 16 portions, lightly roll each of them into a small ball, and place the balls onto a lined baking tray. You’re supposed to place them 5cms apart, but I just put them 3cm apart. 8. You’re supposed to wait 1 hour for the balls to rise slightly, but I just waited 15 minutes. 9. Flour paste – Mix the flour, sugar and water in a small ball. Spoon the mixture into a piping bag – I use a plastic zip lock bag, and snip the end off one corner. 10. Pipe crosses across the buns. 11. Bake the buns for 25 minutes, until the tops are nice and dark golden colour. The darker the better! 12. Syrup Glaze – Lightly boil sugar and water in a small saucepan. 13. Once the buns come out of the oven, brush the tops with the glaze. 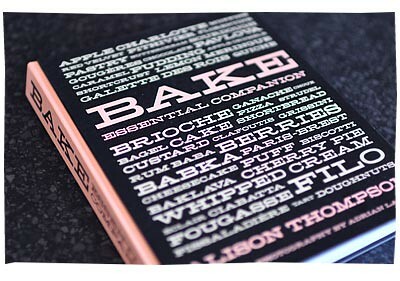 This is the cook book the recipe came from, Bake by Alison Thompson. Full of easy-to-bake classic baking recipes. Can’t wait to try out more.